I need to install a LaTeX package on my MikTeX system.
! LaTeX Error: File `biblatex.sty' not found. I have changed the options to have the "Quick Build" command that includes biblatex too. Code/commands are correct because it's working under Overleaf. With that feature enabled it is usually not necessary to install a package semi-automatically. 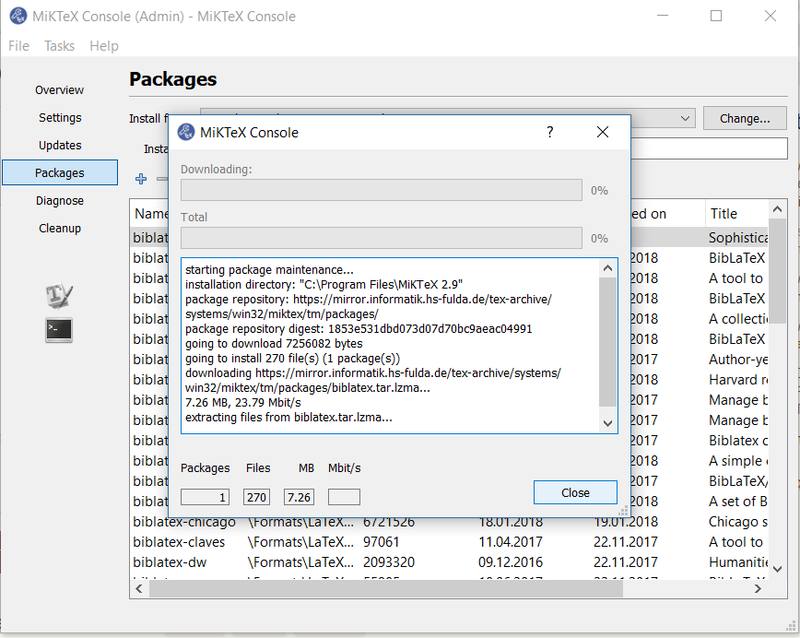 Packages can be installed semi-automatically in MikTeX using the MikTeX Console (https://miktex.org/howto/miktex-console). Before you install new packages it may be a good idea to properly update your installation. If you haven't updated in a really long time you risk ending up with incompatible package versions. See How do I update my TeX distribution? and How should one maintain and update a MiKTeX installation? for more details. 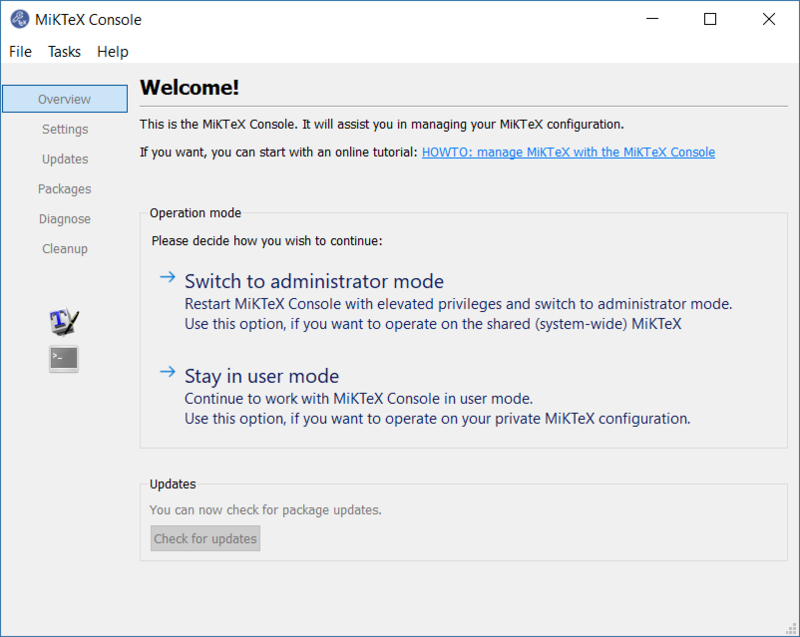 Open the MikTeX Console. 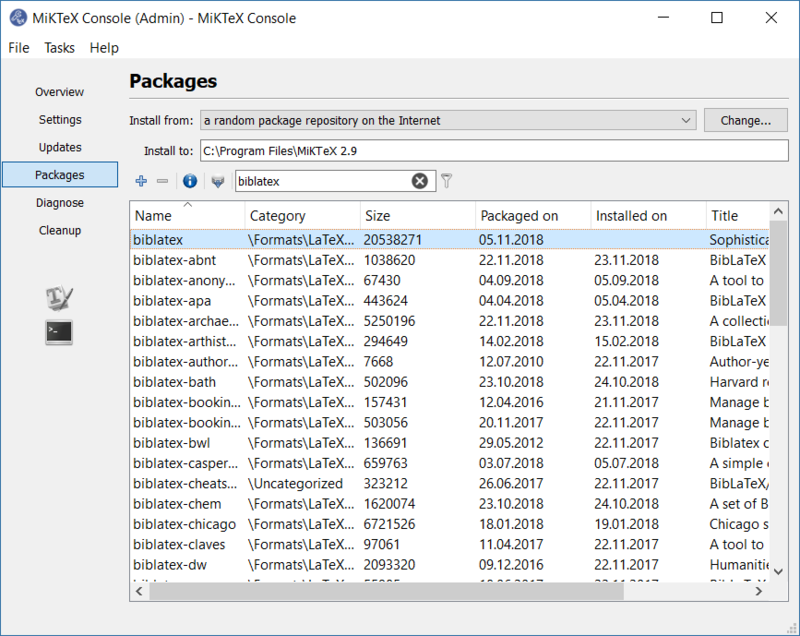 During the installation MikTeX will probably have placed an icon for the Console somewhere on your desktop or your start menu. 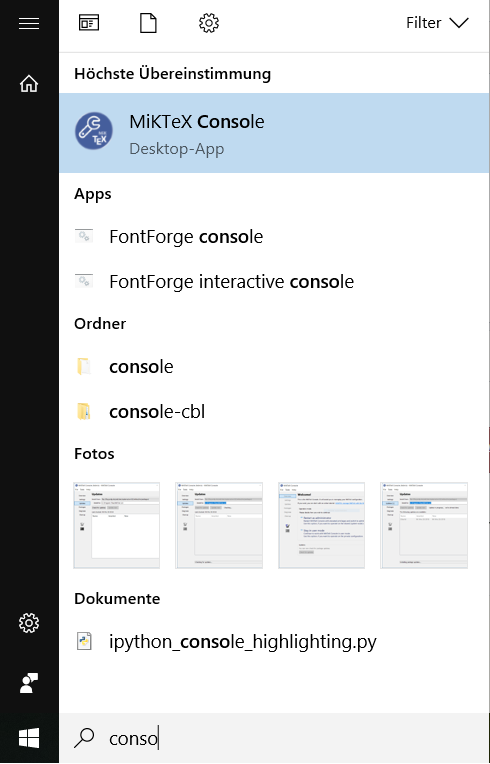 It is also easy to find the Console by typing "Console" into the search field. If you open up the Console you may be greeted with a screen asking you to choose your mode of operation. 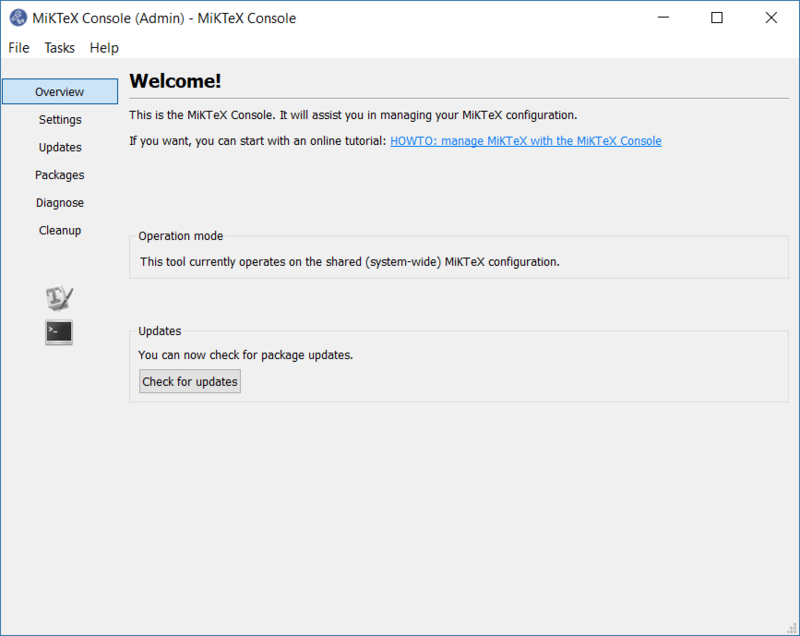 If you are running a multi-user installation, you can choose to run the Console as admin (which lets you install packages for all users) or as user (which lets you install packages only for the current user). Note that user-installed packages take precedence over globally installed packages. So the admin mode is not "more powerful" than the user mode. 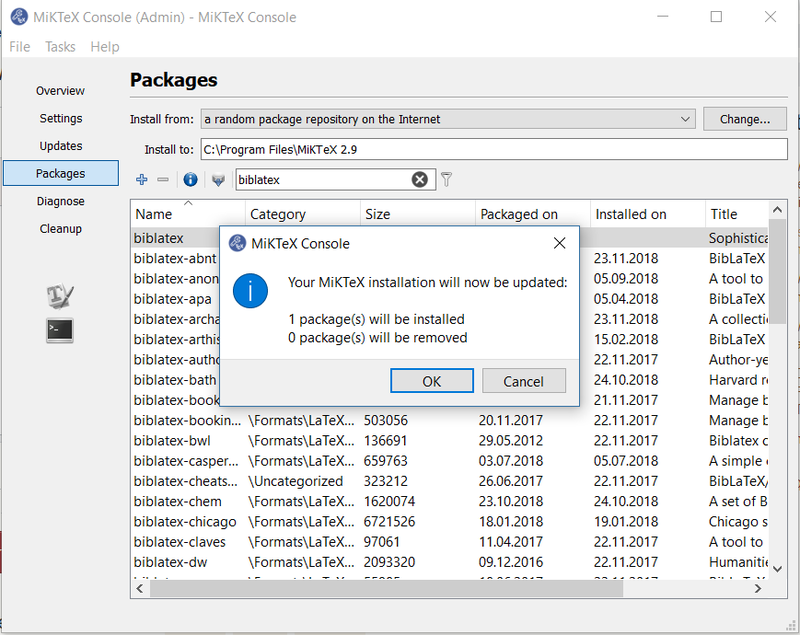 For this reason many people advocate installing MikTeX in a single-user installation. That avoids the two modes. After you have chosen you operation mode you will be greeted with the welcome screen. On the left you will find a tab reading "Packages", click on that. Type the name of the package you want to install into the search field and hit enter. The Console will list all relevant search hits. 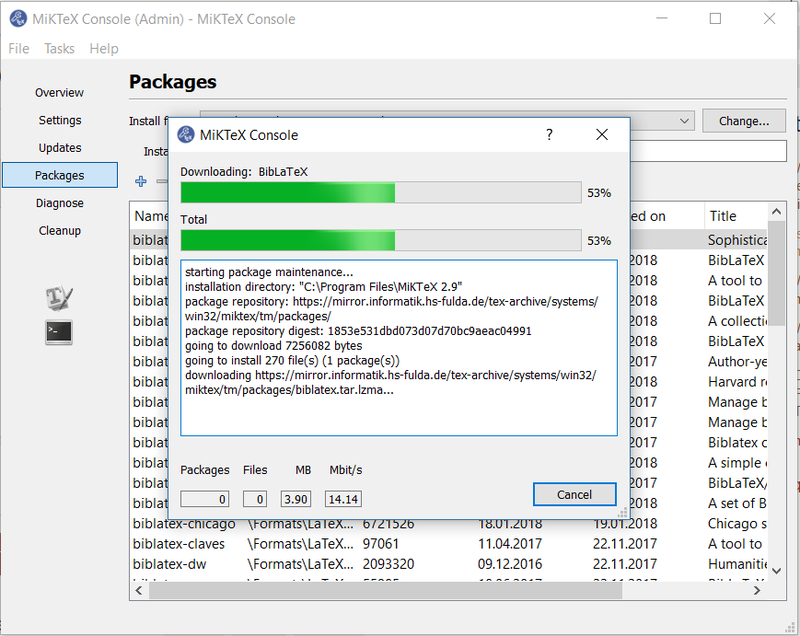 Move to the package you want to install. If it is not installed already, there will be no "Installed on" date. Right-click on the package you want to install (you can select several packages at once if you like). A confirmation dialogue pops up telling you how many packages are going to be installed and uninstalled. The packages will be installed. You can see the progress. When the installation is completed, the button on the bottom right switches from "Cancel" to "Close". 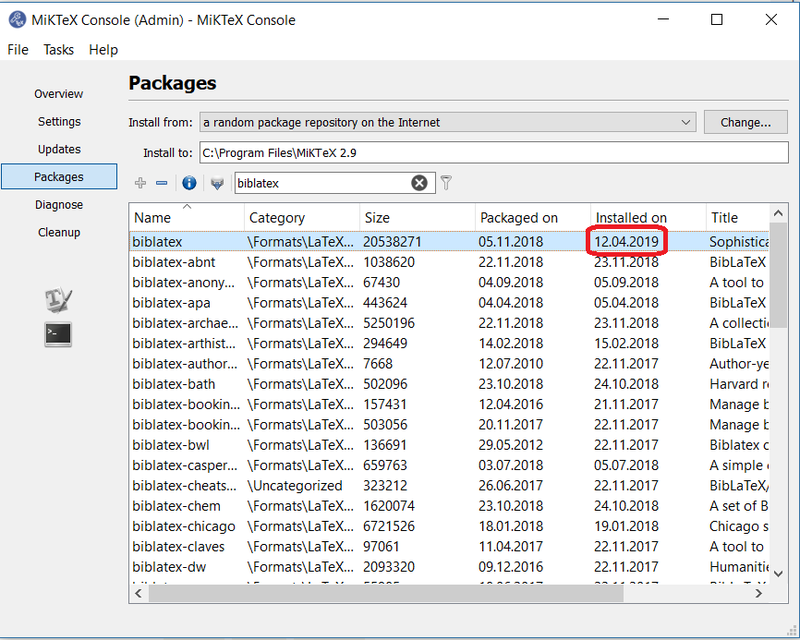 The package list now shows a date in the "Installed on" column for the package(s) just installed. 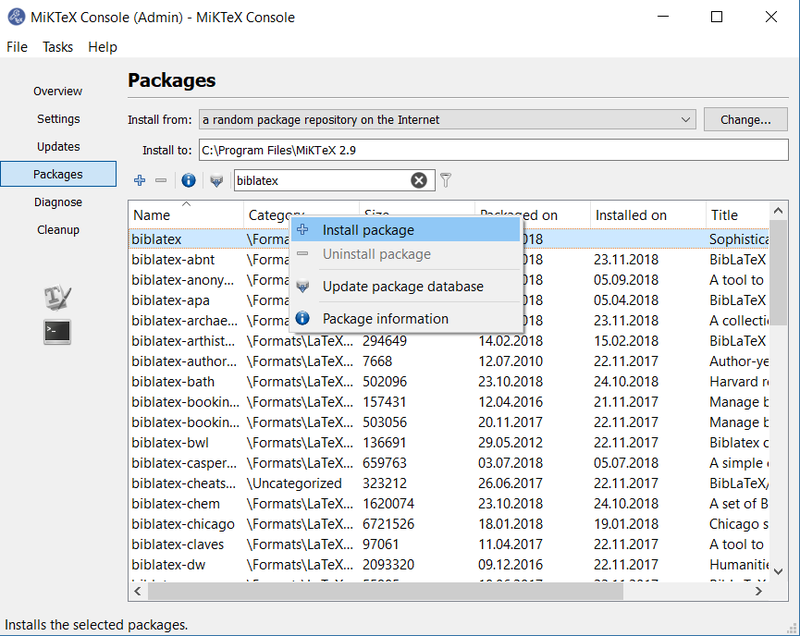 How to install the xpatch package in MiKTeX?